Just to go along with my last post, I want to share a couple of reviews I just received for A House Near Luccoli. The first is from Lauren Scott, who is a wonderful inspiring poet, who writes from the heart. Thank you so much, Lauren! that you simply can’t put down, then I highly recommend this historical novel, A House Near Luccoli. Here is Lauren’s review at barnesandnoble.com. 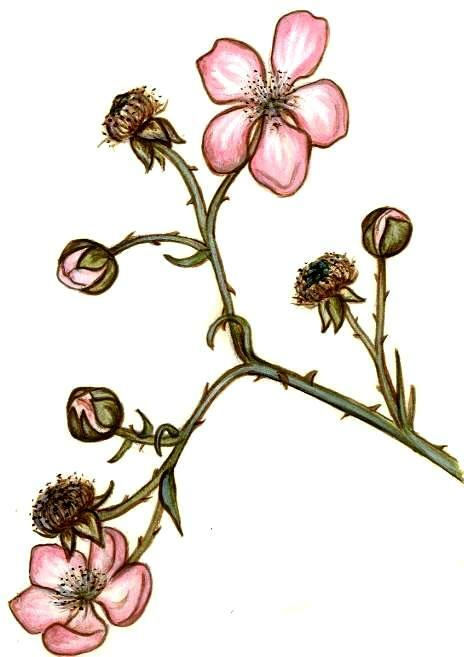 Visit Lauren’s beautiful poetry blog: lscottsthoughts. She has a poetry book coming out very soon! The second review is from Sam, who is a Goodreads Librarian and lives in the UK (Wales). She won a paperback copy of the novel in the last Goodreads giveaway contest I ran. Thank you so much Sam! 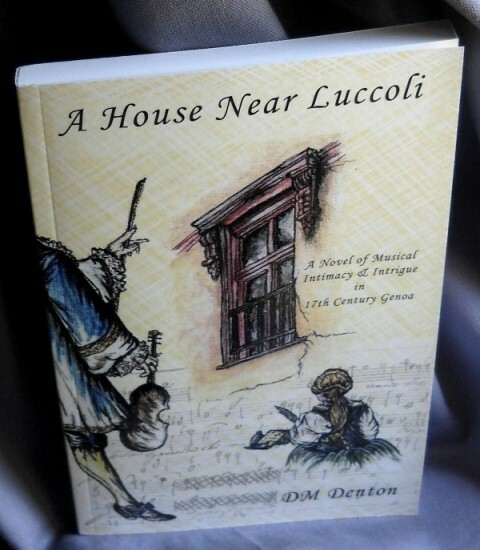 A House Near Luccoli is a poetic and thought-provoking historical novel. At times joyous, at others melancholy, it tells the story of Donatella, when the composer Alessandro Stradella moves into the house she shares with her aunt and bed-ridden grandmother. Stradella takes over the top floor and soon becomes a central part of Donatella’s life. The book is not a long one, but it’s not a fast read. There is so much detail in virtually every sentence that it’s something to linger over and savour. I often found myself rereading passages just to be sure I’d caught every last nuance. The book is set in late seventeenth century Genoa, and the descriptions of the house, the city as a whole, and some of the places within it are a delight to read. You get a real sense of the place and the people who lived there, and can join Donatella on one of her rare trips out of the house, experiencing what she does along the way. The characters are exquisitely painted. Alessandro Stradella himself was a real person, a composer who has all but been forgotten today, but who was the equivalent of a rock star in his time. His life was quite the scandal at times, and he moved around Italy to escape those scandals, finally ending up in Genoa in his middle age. There are hints of his past in some of the stories and references made to happenings in other cities, but Genoa seems to have accepted him, and he composes, conducts and performs his music in a variety of settings. His character was certainly fascinating enough that I’m going to find out a bit more about the real man, and listen to some of his music. Donatella is a lovely, loving woman. She clearly adores her grandmother, Nonna, who was an opera singer when she was younger. Although Nonna never leaves her bed, she comes to life through her conversation. It is Nonna who persuades Donatella to become a copyist for Stradella, although Donatella’s aunt, Despina, is bound to disapprove. The three women are a wonderful contrast. Nonna pushes at the boundaries of respectability. Donatella, who is in her thirties, has resigned herself to being unmarried and has settled into a drab existence revolving around her home, although she does have occasional flashes of rebellion. 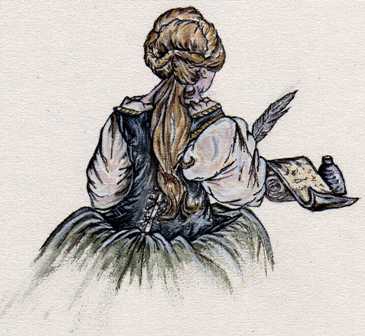 Despina is strict, disapproving of many things, and anxious to maintain propriety at all times. 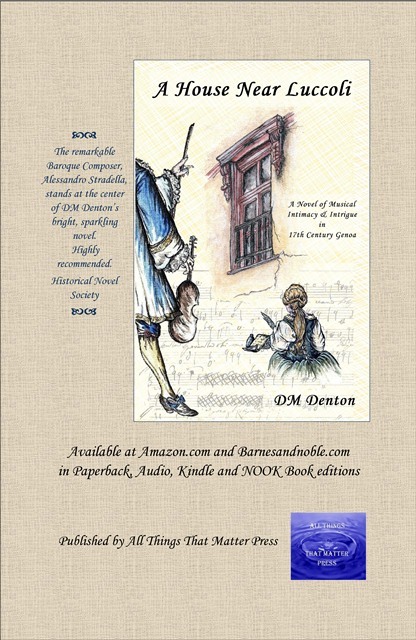 Add the flamboyant Stradella and his disrespectful manservant to the household, along with the ladies’ housemaid and the cook, and a few supporting characters, and the whole becomes a wonderful contrast of characterisation. This was a truly beautiful story and one which I thoroughly enjoyed. The combination of period and location was one I wasn’t particularly familiar with, and it was a joy to read of a place and time that were unknown to me before. This book was won in a Goodreads giveaway. My thanks to the author for making it available, and for posting it all the way over here, and for the thoughtful inclusion of two beautiful bookmarks and a card—thanks D.M.! The author has no input to, or preview of, this review. Here is Sam’s review at Goodreads. It means so much to have one’s writing appreciated and understood, as I know many of you feel. Hope everyone is enjoying the start of autumn. We are having a spell of beautiful bright sunny days and crisp nights. Blessings! My historical fiction, A House Near Luccoli, imagining an intimacy with the Italian Baroque composer, Alessandro Stradella, has been out for a year! It is available in Paperback, Kindle and NOOK BOOK editions, and also as an Audio Book. I still pinch myself, feeling so blessed to have caught the attention of the award-winning novelist, Marina Julia Neary, who introduced me to my wonderful publishers, Deb and Phil, at All Things That Matter Press. They consistently offer sincere support, encouragement, respect and friendship to their authors who are also very supportive of each other. I hope to have a long and productive relationship with ATTMP! At this (just over) one year anniversary of the publication of A House Near Luccoli, I want to express my heartfelt appreciation to everyone who has purchased, read, is reading or planning on reading the novel, and to those who have taken the time to write and post a review. You can see many of them here on my website. Reviews, ratings and recommendations are very important to a book’s exposure, to expanding its readership and giving it more chance for success. If you enjoyed the novel, please spread the word! So, a gentle reminder and entreaty: if you did read A House Near Luccoli, are in the process of doing so or planning to, a review (of any length) would be welcome and can be easily posted to Amazon, Barnes and Noble, and Goodreads (if you are a member). Whenever and wherever I share a review, I am happy to link back to the reviewer. I also am open to review exchanges. If you don’t feel comfortable writing a review, I would still welcome your feedback, even in the comments on this blog or somewhere else like Facebook. If you wish to do so privately, there is a contact form on my website. If you have not yet considered ‘visiting’ A House Near Luccoli, I invite you to go to my website to read about it, including excerpts and an audio sample. Thank you all for your friendship and encouragement as I pursue my passion! I wish you all much happiness and fulfillment in whatever yours may be. 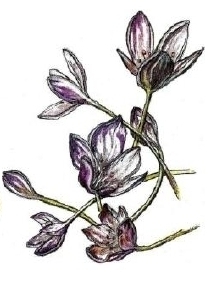 Finally, I’m offering this excerpt from my other publication, A Friendship with Flowers, with the understanding that taste in reading like anything else is a very personal thing. 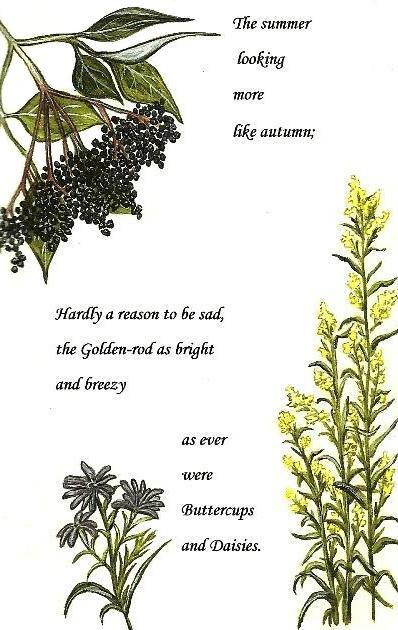 The summer looking more like autumn; hardly a reason to be sad, the Golden Rod as bright and breezy as ever were Buttercups and Daisies. I love the descriptive quality of this excellent poem by Martin Shone. Perhaps you too, as you read, will feel like you’re walking along with him observing and reflecting on the changes so naturally and inevitably coming. And please make sure you listen to Martin reading this, too. 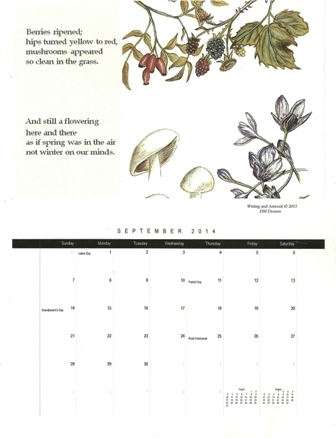 I have designed and created a 2014 Calendar from some of the artwork and writing I have posted here over the past few years, reflecting on weather, flowers, insects, birds & animals. It is a premium full-color calendar printed on heavier weight paper, spiral bound at the top, and quite large, measuring 13.5′ x 19″. You can preview all twelve months at lulu.com, where it is available for purchase. It would make a great gift for Christmas, or any upcoming occasion, or just for yourself! Thank you, as always, for your interest and support.